Tester: Middle Eastern, (Lebanese) with normal skin on body. "I love beauty innovations, and products that have (effective) 2-in-1 capabilities as well. This product was created to be soap and a sponge that also exfoliates. 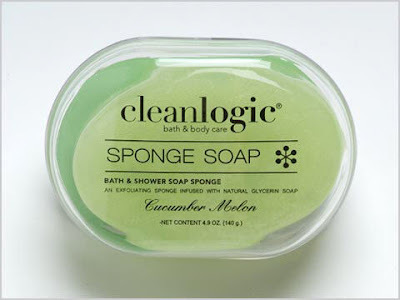 I used the Cucumber Melon, which was a really refreshing and clean scent, with authentic fruit notes. When I opened the soap for the first time, I could see that in the middle of the soap was the sponge, which was surrounded by the soap itself. When I got it wet in the shower, I could actually feel the sponge material on my body and it automatically created a nice lather effect. The scrubbing effect was gentle yet thorough. (With repeated use, the soap then appears as a sponge with the soap lathering from within it). It's the perfect shower item for the gym (and travel) as it also comes with its own soap dish. The cleansing effect was nice – not too drying and very thorough without leaving any residue or film on my skin. If you have very dry skin however, you will need additional moisturizer after using this soap. For those of you who like to get a quick shower in AM, this is the perfect time saver, and it’s also a great product for the family, as kids can easily hold and use the product and get a great clean as well." T.A. Note: Clean Logic products are paraben free & made of natural ingredients.